Facebook says it has removed 32 accounts and pages believed to have been set up to influence the mid-term US elections in November. It said it was in the "very early" stages of the investigation and did not yet know who was behind the pages. It said the account creators had gone to greater lengths to hide their identities than a Russia-based campaign to disrupt the US presidential vote. It described attempts to erase election interference as an "arms race." The social network said in a blog that it had identified 17 suspect profiles on Facebook and seven Instagram accounts. It said that there were more than 9,500 Facebook posts created by the accounts and one piece of content on Instagram. In total more than 290,000 accounts followed at least one of the pages involved, it added. 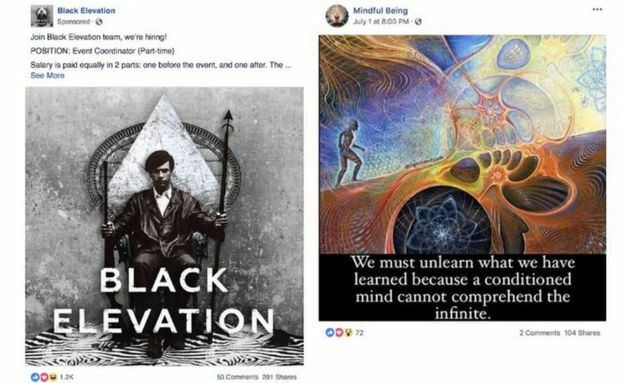 Facebook said the suspect accounts had also run about 150 ads on Facebook and Instagram, costing a total of $11,000 (£8,300). The "bad actors" went to far greater lengths to cover their tracks than the Russian-based Internet Research Agency (IRA) had in the past, Facebook said. This included using virtual private networks (VPNs) to hide their location, and using third parties to run ads on their behalf. The social network said it had not found evidence of Russian IP (internet protocol) addresses. But it did find one link between the IRA and the new accounts. One of disabled IRA accounts shared a Facebook event hosted by the Resisters page. The page also briefly listed an IRA account as one of its administrators. 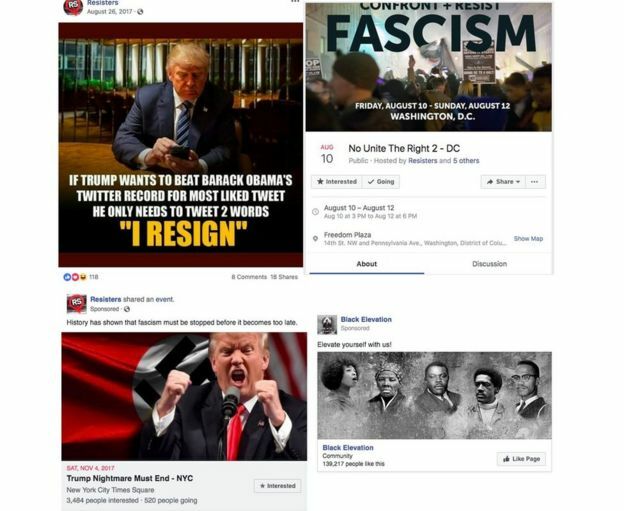 The Resisters account also created a Facebook event for a protest on 10 to 12 August called "No Unite the Right 2". Facebook said it would alert the 2,600 users who had expressed interest in the event. It added that it "may never be able to identify the source" for the fake accounts. Republican congressman Adam Schiff said in response to the news: "Today's announcement from Facebook demonstrates what we've long feared: that malicious foreign actors bearing the hallmarks of previously-identified Russian influence campaigns continue to abuse and weaponise social media platforms to influence the US electorate." "Foreign influence actors remain readily capable of manipulating raw emotion and societal divisions to prey on unsuspecting Americans who use these same social media tools for legitimate political expression, organisation, and advocacy." The Democratic Senator Mark Warner, who is vice chairman of the Senate Select Committee on Intelligence, also pointed his finger at Moscow. "Today's disclosure is further evidence that the Kremlin continues to exploit platforms like Facebook to sow division and spread disinformation, and I am glad that Facebook is taking some steps to pinpoint and address this activity," he said. "I also expect Facebook, along with other platform companies, will continue to identify Russian troll activity and to work with Congress on updating our laws to better protect our democracy in the future." Republican Senator Lindsey Graham added that he intended to pursue retaliatory measures. "I will be introducing Thursday a sanctions bill against Russia that has everything but the kitchen sink in it," he declared. "It'll be the sanctions bill from hell. And any other country that is trying to interfere with our election should suffer the same fate."